Anyway, if you are a parent that reads to your children, you know the pain of reading a lousy book. I’m sure you are also familiar with the ache you feel deep in your soul when your child loves the worst book ever published. After suffering through said book enough times in a row, you might even come to believe that there could actually be a bright side to your child dying the next day. At this point, most parents realize the only way for their sanity to be preserved is for the book in question to become “lost” in the house somewhere. Can’t we read something else? The back of this Duracell package, perhaps? 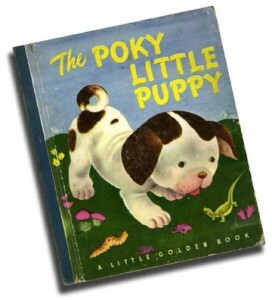 In 2001, The Poky Little Puppy became the bestselling hardcover children’s book of all time, and I have to believe that’s because so many copies have been destroyed by desperate parents. This is the book that puts me over the edge. I would love nothing more than to collect every single copy of The Poky Little Puppy and send them all back to where they came from. And I don’t mean Golden Books, I mean the darkest pit of hell. My brilliant “loss” of that book was undermined a few years ago by a holiday book exchange in my daughter’s class at school. Me (in my head): Please. Kill. Me. Preferably before story time tonight. The last time I had to read that book, I cut the story in half by having the poky little puppy die after eating the chocolate custard. The moral of my abridged version of The Poky Little Puppy is chocolate will poison dogs. And I think we can all agree that’s a far better lesson than the real moral of the story, which is, as far as I can tell, when you disobey your mother, don’t be slow about it – or eventually you won’t get any dessert. I truly don’t think I can adequately put to words how much I despise The Poky Little Puppy. Listen, if I’m alone in that, that’s okay. Because all parents have their own personal Poky Little Puppies. We have all suffered through countless books that in our minds had no business ever getting published, and even more children’s books that could very generously be described as “Meh”. So it comes as an exhilarating thrill when we encounter one of those rare gems that entertains, touches and amuses both parent and child alike. Those books are the bestest. Yes, I know bestest isn’t a word. You’ll have to excuse me, though, because this post is a tribute. A tribute to somebody I’ve never even met. Or talked to. Or heard. Honestly, I know next to nothing about her. But I know that she passed away on November 15th of last year. And I know that she has brought hours upon hours upon hours of unbridled joy, laughter, and even a few sniffles to my entire family. It was fifteen years ago that we first became acquainted with the work of Barbara Park through the misadventures of a kindergarten girl named Junie B. Jones. We would gather in my son’s room every night and laugh and laugh, sometimes until tears ran down my cheeks. We read through every one of the Junie B. books that existed at the time. Twice. Maybe more. 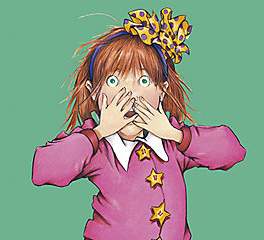 The incorrigible Junie B. Jones, by her illustrator, Denise Brunkus. 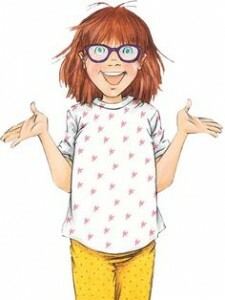 At some point, quite early in the series, I decided that Junie B. Jones sounded best with a southern drawl. I know it makes no sense that she’s the only one in her entire family that sounds like a redneck, but it just sounds so right with everything she says and does. The next time you read a Junie B. Jones book, give it a try. Fast-forward seven years. Our daughter was about to start kindergarten, so we started reading Junie B. Jones to her. And here’s something magical: Her 16 year old big brother joined us for the fun, and to catch up on the new stories that weren’t published yet when he was younger. And again, we went through the entire series at least twice. Over the next seven years, our collection of Junie B. Jones continued to grow, and get quite a bit of wear and tear. That first daughter would read the whole series several times on her own over the next few years. Her little brother would start kindergarten, and we would read through them all as a group again. Every time a new book would come out, we would read it together as a family (minus the oldest this time). Then our youngest daughter became a kindergartner, and we started the series over again. And then read it again. When we finished reading them together, she started reading them independently, and she read them voraciously. My daughter had just bought Junie B.’s newest adventure at the school book fair last November, when I read online that Barbara Park had passed away after battling ovarian cancer. I solemnly shared the news with my family. Through all of 2013, I had been reading aloud through the entire Harry Potter series to my younger kids, but we took a break from it to share the final Junie B. Jones book together. When we finished it, I mentally retired Junie B. Jones, thinking that might very well be the last time I read one of her stories to my kids — and that made me sad when I reflected on all the good times Barbara Park had brought us through her creation. Yet I knew that my kids had moved beyond Junie B. as readers, and perhaps the death of Barbara Park would mark the end of that era. Something happened in the spring of 2014. And it is called we adopted a kindergartner, people! The boy kind! So when it came time for bedtime stories, in my mind, there was only one obvious choice that would unite our new blended family together. Her name was Junie B. Jones. The books came off the shelf, and we’ve spent hours reading through the exploits of Junie B. once again, giggling with anticipation as we approached our favorite moments, and getting to experience them freshly through the eyes of our newest family member. At some point in the middle of the summer, I looked up from one of the books to see our oldest son, 23 years old, standing in the doorway to our room, listening with a smile on his face. He was transported to a time long ago, like he was catching up with an old friend. About the time of Barbara Park’s death last year, I was made aware of controversy regarding all of the Junie B. Jones books. Evidently there are quite a few parents who feel a genuine hatred for the books and their make-believe main character. If you don’t believe me, feel free to read some of the One-Star reviews on Amazon. Their main beef with the books tends to be that Junie B. misspells a few words in each book, she says such vile no-no words as dumb and stupid, and she never gets in trouble for her bad behavior. Certainly any children reading Junie B.
Jones will never score highly on the SAT, they will regularly use the D-Word and the S-Word, and they will behave in an uncouth manner. You know, like how people who read the Bible a lot tend to act exactly like Jesus. Listen, Junie B., as a character, is complicated, like most of us. She is a loudmouthed ball of sass who underneath it all is a scared and insecure little girl. Yes, like all kindergartners and first graders, she misspells and misuses some words – and she is often corrected by other characters in the book. She is impulsive and has no filter on her big fat mouth – and gets into trouble because of it. In the stories, she often rushes to judgment about people and situations – and is later proved wrong. I fail to see the problem with any of that. And I’ve got five kids in the house who love Junie B. Jones — yet have never taken on her behavior.